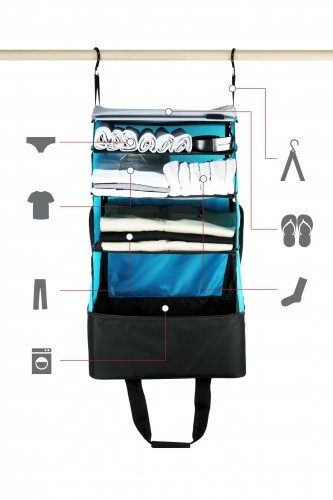 Rise Gear, an innovative portable closet, is the solution for frequent travelers looking for better ways to pack and an alternative to living out of an unorganized travel bag. The Rise Gear collection of travel bags features built-in collapsible shelving, allowing travelers to organize and separate items from each other within the bag. When it comes time to unpack, travelers can pull the shelving system up from within the bag and secure to either a closet bar or back of a door. The portable closet features laundry compartments under the shelves to keep dirty clothes away from clean items and is ideal for keeping books, magazines and electronics flattened during travel. Because the bag hangs up off the floor, travelers also don’t have to worry about potential critters hopping in their bags. The company offers three size options in blue, gray and pink: The Jumper ($79), The Weekender ($99) and The Roller ($159). The Jumper functions as a shoulder bag, allowing users to keep basics separated, and can be used as a carry-on. Up to two Jumpers can fit in a 28-inch rolling suitcase for maximum organization. The slightly larger Weekender features additional space and exterior pockets for items such as hair appliances and makeup or toiletry bags. The Roller includes wheels to make walking more manageable, large exterior pockets for bulky travel items and a drop bottom to keep suits and dresses from getting wrinkled. Learn more about Rise Gear on their website.